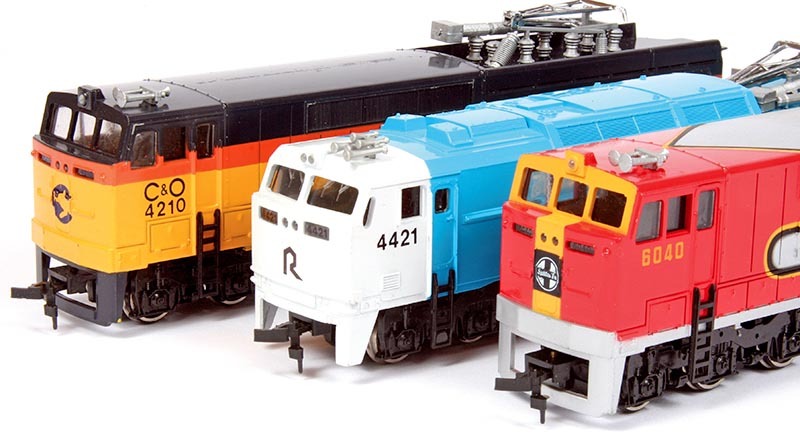 These Bachmann E60 electrics make for a colorful collection of “what-if” locomotives, where an electrified mainline throughout the U.S. may very well have seen such motive power displaying these paint schemes. Regardless, the HO-scale renderings add some variety and a little pizzazz to the collector’s roster. Note, the freight units (Chessie System and Santa Fe) are equipped with three-piece windshields, while the passenger Amtrak E60 situated between them boasts only a two-piece arrangement – all per the prototype locomotives. 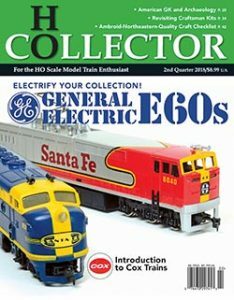 American GK Locomotive Works would be the first to offer modelers a rendering of the General Electric E60 series locomotives. The Chatsworth, California-based company contracted with Athearn to produce HO-scale kits of both an E60CP and what it referred to as a “E60CF” with an additional “F” added to GE’s designation to better set apart the freight version. 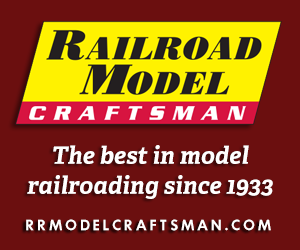 An advertisement for both models, which were manufactured entirely in the U.S., first appeared in the May 1976 issue of Railroad Model Craftsman and were also featured in the 1976 Walthers catalog with product not actually hitting hobby shop shelves until late summer or early fall of that year. With an introductory price of $26.95 (that’s equivalent to $115.95 in today’s dollars), the E60CP was available decorated for Amtrak and Penn Central, and undecorated, while the E60CF came lettered for the BM&LP, Penn Central, The Milwaukee Road, and New Haven as well as undecorated. If you have ever built an Athearn Blue Box locomotive kit, then you will have a good concept of the construction of the American GK offerings. Each model included a one-piece injection-molded shell, a heavy die-cast metal chassis, metal GE sideframes, and Athearn’s standard horizontal drive mechanism, featuring a dual-flywheel-equipped can motor and 12-wheel drive and electrical pickup. An envelope full of modeler-applied detail parts was included that contained the window glazing and headlight lenses; pre-bent wire handrail; plastic air horns; the rooftop-mounted insulators, bus bars, circuit breaker, and lightning arrestors associated with the pantograph; the necessary pieces for assembling the sprung metal pantograph(s); and number board decals. As the pantograph assembly is made of metal and attached to the roof via a screw, the modeler could actually wire these models up for accepting overhead power. Both models were reviewed in the June 1977 Railroad Model Craftsman and found to be properly proportioned based on the prototype information at the time. In fact, the review states the single-cab freight version actually reflects a “second-generation” design “based on data obtained from GE” that improves upon the units constructed for the BM&LP. As none of these later E60s were ever constructed as such, the American GK freight electrics remain the most unique offerings among the E60 family of models produced to date. The review also states that, other than the taper of the window openings in the cab of the E60CP and the shape of its pilots differing from those of the Amtrak locomotives, no major faults could be found with the passenger model’s overall presentation. To this observation, I would add that the ladders under the doorways of both models, which are molded-in the carbody, have been shortened a bit from their appearance on the prototype, most likely due to operational constraints on tight radius curves, and the flush-fitting nature of the window glazing was particularly well-done for the time period. It’s also worth noting that, while Athearn appears to have tooled up a new chassis for the passenger unit, the E60CF reuses the company’s SD9 frame, the rounded fuel tank of which is not accurate for an electric locomotive in the least. For a modern electric locomotive in general, one would expect to see a squared-off compartment situated between the trucks, housing the batteries and other electrical equipment with a couple of air reservoir tanks located alongside of it as well; so a bit of corrective modeling will be in order regarding the freight unit. Moving on, over the next year or so new road names and dummy versions of both models would be added to the product line. For the passenger unit, this would include New Haven’s McGinnis scheme and an unlettered silver-painted carbody, while the E60CF would see Burlington Northern, Conrail, and Great Northern added to the lot. The powered units remained $26.95 through 1979 with the new dummy units retailing for $18.95 each. At some point during the early 1980s, Walthers acquired the tooling for the American GK E60s and began marketing the kits under its own brand name. Initially, the same paint schemes were carried over into the 1984 Walthers catalog and the E60CP was prominently featured on the cover of the 1985 catalog. By the time the 1986 catalog was in the hands of hobbyists, the retail prices on the powered passenger and freight units were $47.95 and $44.95 respectively with dummy versions listing for $27.95 and $24.95 each. 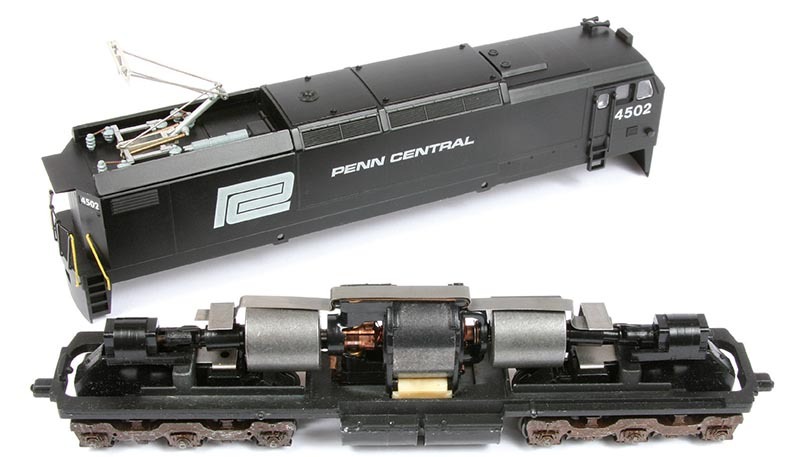 The text accompanying the listing in the catalog states Athearn’s new second-generation can motor now powers these models and that the pantograph comes fully assembled..